Not much was happening…. | Janet Dahl, et al. I remember when I was young, and multitasking was second nature for me. I could juggle babies, housekeeping, law school, a crazy husband and a whole house makeover with no difficulty. There was a year when I had a child, managed two others, rehabbed a home to sell and move, moved, redecorated every inch, bought a cottage and decorated it. Now that I am settled, I am unfocused and manage my time very badly. I get up late, while away the morning reading papers, and fiddle with the small demands of maintaining order in a house with two inhabitants. My life has changed with Steve at home. Each day, a troupe of Dahlcast pros invade the house. They go subterranean, and I continue my diffused existence. There is luxury in the lack of responsibility, but the minimal nature of my daily accomplishments is getting to me. I am too easily derailed. I am currently having the downstairs repainted, room by room, and the change has me all discombobulated. At this place in my life, I am moving to shades of beige. I am resisting the extended metaphor that the color, vibrancy and life has passed in my life. But there it is. More about this home improvement surge later.... All of the foregoing is an apology of sorts for my lack of activity here. I have no excuse except that at times my life is so dull that I have no inspiration. 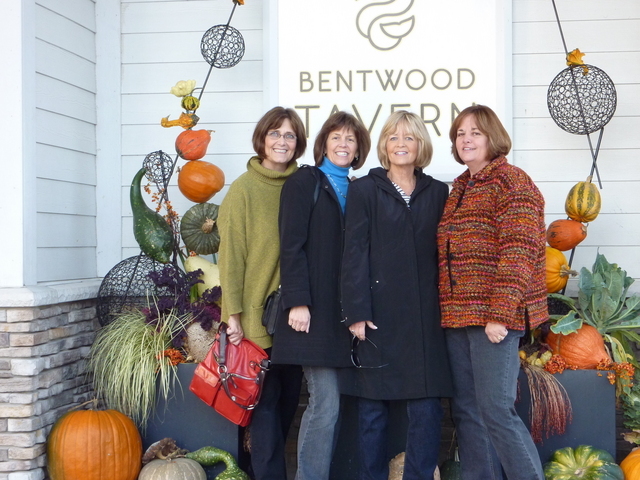 My sisters' weekend was wonderful, but I am sure no one really needs to hear the details. We shopped, ate, drank wine and coffee, and beaded. We have commemorative sweatshirts and a boatload of memories. Some really nice people sent me ideas from their getaways, and I fully intend to steal them. 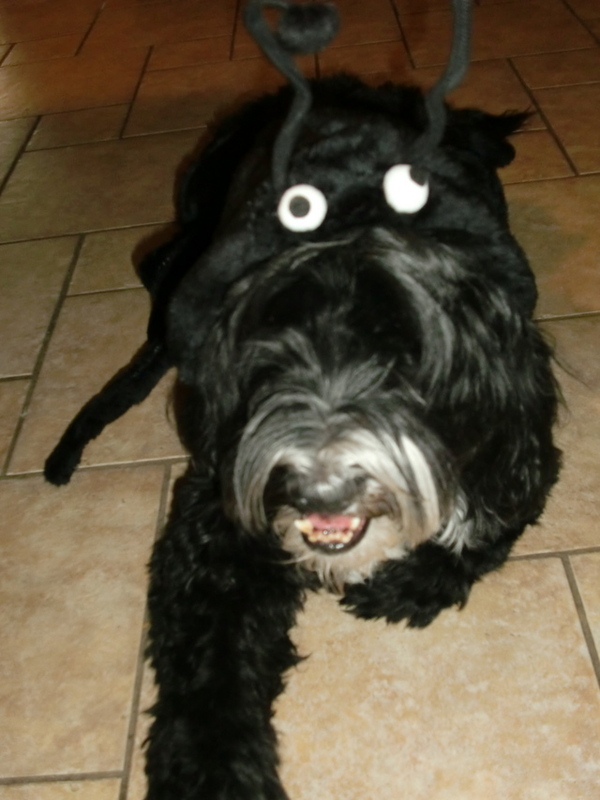 Halloween was its usual kind of day, with a severely reduced number of trick or treaters-200- arriving at the door. I am not sure if H1N1 worries reduced the glee, or parties scheduled for Saturday; we usually hand out 300 candy bars. I was ok with the smaller crowd, and Steve was joyous until he realized he was addicted to Baby Ruths. The surplus has been whisked away. 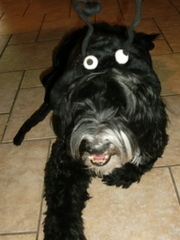 Millie was a spider, and she seemed to like having a hood with googly eyes. She is an unusual canine. 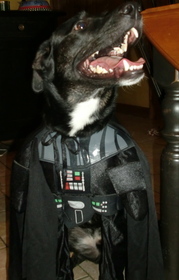 Matt and Walter made it a fun day, with Wally reprising his annual role of Darth Vader. He was a hit. 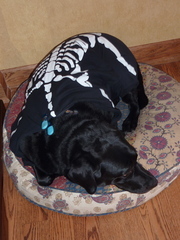 Mabel was a skeleton, and I forgot and let her outside in costume. She obliged by thoroughly wetting the tailbone section-if a dog skeleton has a tailbone- and then dripping all over the house. The highlight was an invitation for dinner from my friend across the street. After the kids had gone home, we were treated to Cincinnati style chili and some adult time. That was a gift. My brother's recovery from open heart surgery was derailed by a threatening case of cellulitis in the leg where they harvested the artery for the graft. He has checked in to the hospital for IV treatment and evaluation, and he is heartbroken. Scared. Trying to be stoic. Me, too. I want to descend upon him, but I realize he is too weak to absorb my nervous banter. Janter, that is. He is in good hands, and of course, in all our prayers. On the really fun side, my friends took me to see Jersey Boys for my birthday, and what a wonderful day it was! We went to a pre-show Wine Bar, and had post show drinks at the Palmer House, and loved every note and word of the play. If you have not seen it- try to get there before they close in January. I am going to buy a subscription to Broadway in Chicago for the family Christmas gift, and make it a tradition. All of us can see a play for less than a sporting event. We will have memories! I will be a better commenter here. Please, don't give up on me! This is the one place that represents progress for me.